The vast majority of deaf children, between ninety and ninety-eight percent, are born to hearing parents. For hearing families, the arrival of a deaf child is usually unexpected and often confusing. In many societies, two distinct and often juxtaposed understandings of deafness exist, each operating to help families and individuals understand and cope with deafness. The deaf cultural identity model emphasizes the shared language and experience of deaf individuals, and promotes signed languages and deaf culture. The medical, or pathological, model posits deafness as something needing a cure, and typically presents deaf people as disabled. Most hearing parents have little or no experience with deaf people, signed language, or a deaf community. In Mexico, this is especially true since the medical model of deafness predominates. My research reveals a difficult tension between Mexican families of deaf children and the medical institutions available to them. In Mexico City, medical institutions are typically the first point of contact for parents with deaf children. The relationship between these families and the medical community is a double-edged sword of mistrust and dependency. During emotional interviews, I’ve listened to parents detail the discomfort and disrespect they experienced interacting with medical staff as they sought guidance to help their deaf children. Many of these encounters with medical professionals fall into two discernible categories of disrespect: dismissal and casting blame. Many of the parent-participants in my project felt that concerns about their children’s hearing and speech development were dismissed by doctors and public health workers. To add insult to injury, many of these parents and their children were also blamed for the child’s condition. A particularly clear example illustrating this dismissal/blame duality is the story of one father who suspected his four year old son had difficulty hearing. When he brought his son to a Mexican public health institution, he was told he should give his son more vitamins to develop his hearing. He was also told his son needed more stimulation at home to learn to speak. To many of us, recognizing language socialization as a naturally-occurring process, both alleged remedies are complete nonsense. However, anyone raising their own children can also sympathize with this father’s initial feelings of guilt, insecurity, and frustration. It was later discovered that this boy’s hearing loss was attributed to an antibiotic prescribed to treat a childhood infection. The child’s parents were never warned of the known risks associated with this drug, and thus their previously-hearing son was profoundly deafened. Often, parents who arrived at these medical institutions with concerns about their child’s hearing were turned away without even a basic hearing exam for their child. Several parents shared that medical professionals blamed laziness as the reason for their children’s delayed language development. This is a recurrent theme, and is always recounted in the same colloquial terms. Doctors and nurses told them “el niño está flojo” (“the child is lazy”) or “tiene que echar ganas” (“you have to work at it”). These statements are both dismissive and accusatory. The notion that some children simply don’t have much interest in communicating their needs and desires understandably to the people in their lives is absurd. Sadly, some Mexican parents accept these ideas because they come from a place of perceived authority: the medical establishment. 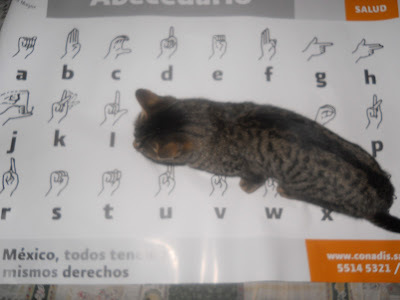 Photo: A student-participant photographed his cat walking walking across the letters of the Mexican Sign Language alphabet. My participants attribute their troubling encounters to the overtly tedious bureaucracy of the Mexican medical institutions they rely upon. Many of my participants assume medical employees in these public institutions have no real interest in serving them. Instead, they believe that medical workers use responses like those described here to deal with them quickly, ineffectively, and without any discernible accountability. In other words, my participants believe they were pushed through the system without getting the kind of help they originally sought, and there is really nothing that anyone can do about it. The dominant medicalized paradigm of deafness in Mexico influences people to understand deafness as something needing to be cured. This paradigm promotes hearing apparatus and speech therapy as the only reasonable options for deaf children, despite the fact that these interventions are expensive and the effectiveness of individual outcomes varies widely. Unfortunately, the medical model of deafness also devalues sign language as a viable possibility, even to potentially augment and enrich the existing medical interventions. Many Mexican parents of deaf children, like the father I’ve described, mistrust the medical community. Their mistrust stems from negligence, misleading information, and blatant disrespect they’ve experienced in this system. Nonetheless, many of these families were forced into the arms of the medical institutions they mistrusted because they didn’t have access to alternatives. Insufficient information about deafness and too few options for families with deaf children perpetuate this paradox of dependency and mistrust. More research focused on understanding the medical community’s goals for serving deaf people might expose gaps in understanding between patients and professionals. Deaf children will be better served when medical professionals accept sign language as valid and recognize its positive potential for socializing and educating deaf children. The cultural model of deafness is not well developed in Mexico, but advocates for Lengua de Señas Mexicanas (Mexican Sign Language) do exist. Nonetheless, opportunities for deaf people to gather and to learn sign language are too few and need to be expanded. A lack of awareness about deafness is apparent in many realms of social life in Mexico, and this contributes to limited alternatives to medical interventions, few practical accommodations for deaf people in the public realm, and insufficient educational opportunities for Mexican deaf children. 1. These widely accepted estimates are cited frequently in literature on deaf issues. For a critical look at United States incidences, please see: Mitchell, Ross E., and Michael A. Karchmer. 2004. Chasing the Mythical Ten Percent: Parental Hearing Status of Deaf and Hard of Hearing Students in the United States. Sign Language Studies 4(2):138.